Store all of your jewelry accessories effortlessly! Never misplace another valuable bracelet or necklace again with this T-Bar jewelry display. An elegant option for independent designers and sellers. Provides a tangle free, well organized, easy accessibility that this bracelet holder display stand adds a modest touch of elegance. 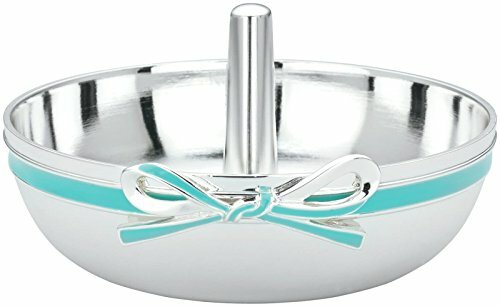 Great for displaying jewelry on counter tops and showcases. Perfect for any home that needs a convenient way to store jewelry. Will not scratch remains show room ready. Also ideal for store front display cases. 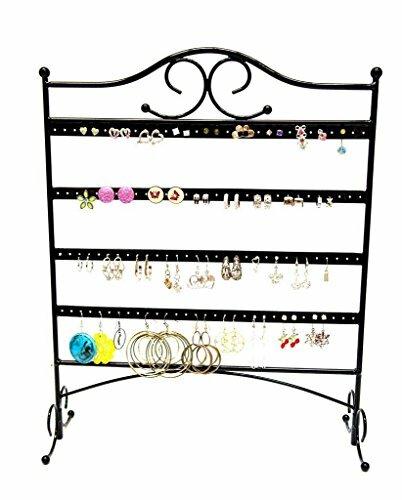 Allows you to hang bracelets, bangles or necklaces and even large hoop earrings. A professional looking bracelet organizer that looks sleek to your jewelry box case and a ring jewelry tray. Make collecting a clutter free daily fashion routine a thing of the past. A perfect gift that is soft to the touch for anyone who wants their jewelry to stand out! NOTICE: The "Super Z Outlet" seller is the only authorized seller, we do not sell wholesale so there should be NO other sellers; Any other sellers are illegally selling their own products using our registered Trademarked company name. In this listing, purchasing from any seller other than "Super Z Outlet" will result in a potentially faulty product that may be unsafe and cause injury. Please be sure to purchase this product from the "Super Z Outlet" seller to avoid any problems with your product and to ensure both your safety and satisfaction. Manufacturer's warranty included only when purchased from Super Z Outlet. Crafted from beautiful black velvet that is soft to the touch and will protect your jewelry from any kind of damage or abrasion. 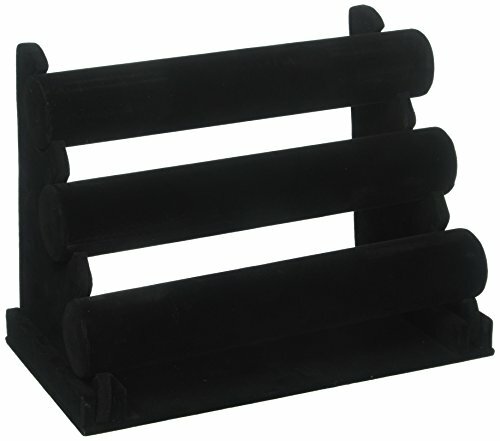 Made from wood with weight on the base instead to prevent tipping over after hanging jewelry. Its short build helps you have many of them side by side for displaying an array of merchandise. Featuring a smooth black velvet material lining, this T-Bar jewelry display is perfect for showing off your watches, bracelets, and necklaces. Constructed with a thick 1-tier top rod and a thin vertical stand and sturdy rectangle base. The black velvet surface helps you see products clearly in contrast againts bright colored jewelry. Highlights and organizes your most treasured jewelry accessories. A black velvet jewelry rack helps you stay organized without taking up much space on your counter top or dresser drawer. Makes a practical and essential business item for retail stores, jewelry and watch retailers. Attractive and sleek appearance suited for jewelry shop window displays. The jewelry display is great for personal use at home and glass counter tops in stores or trade shows. Organizer can hold 60 pairs of earrings. BEAUTIFULLY DESIGNED! This decorative elephant ring holder contains beautiful etched designs on the body of the elephant and open lotus flower. ELEGANT ORGANIZING! 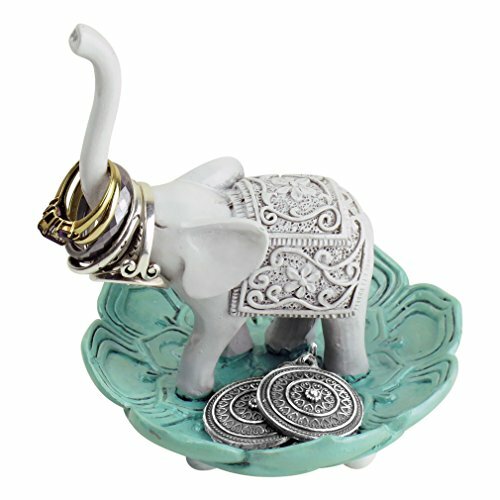 Rings slide onto the elephant's upturned trunk and small jewelry like earrings, pins and necklaces rest in the lotus flower bowl at its feet. 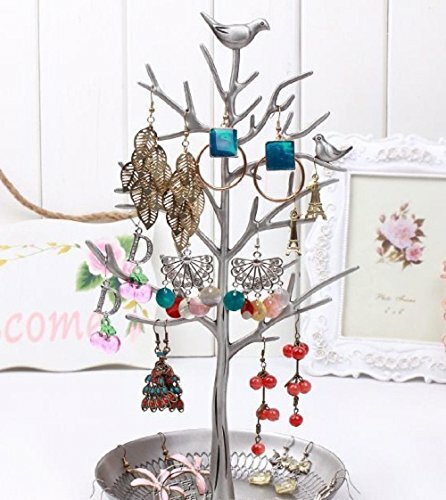 Keep all of your rings beautifully displayed, organized and safe near the sink, cabinet, bedside or dresser with this gorgeous jewelry holder. MANY USES! Great gift idea for the jewelry lover, birthday present, holiday or friendship. Small size and lightweight design makes this jewelry holder perfect for travel. UPSCALE DESIGN! Made out of polyresin with a gloss finish. Measures approximately 2.5L x 1.13W x 4H, (including the elephant's trunk) with a 3.25 base diameter. Size: Dish diameter is 5.1 inch. Height including stand unicorn is 3.9 inch. Jewelry Organizer: Perfect resting place for engagement and wedding rings...or ANY rings. Keep your valuables safe while you wash dishes, shower, or scrub the floor. Gift Idea: Affordable gift for wedding, engagement, Valentines, anniversary, birthday, Christmas or Mother's day. 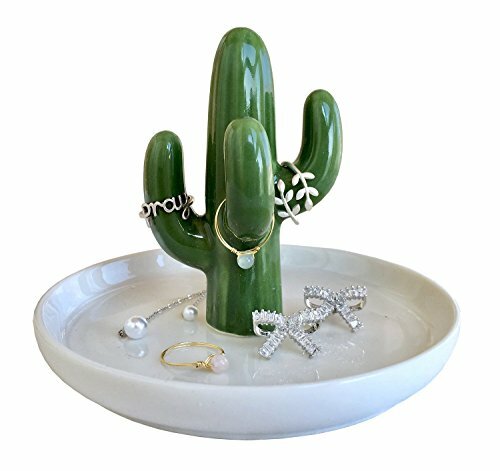 Home Decor: This space saving ring dish can be placed in living room, bathroom, washroom, bedroom, kitchen, office or displayed in store as eye-catching decoration. Crafted from high quality glazed ceramic, not easy to break. Featuring Green cactus on white dish. A great way to showcase and organize your rings, necklace, hand chain, bracelets, earrings and other miscellaneous jewelry pieces, allowing you to take off your ring without Worrying About Them Getting Lost. Suitable size. Measures approximately 5.1L x 5.1W x 3.9H. The item is well packed before shipping. Best addition for dressers, nightstands, bedroom, living room or bathroom counters, it is a beautiful ornament that adds sophistication to your home decor. A great gift idea that does not need any occasion at all. Perfect gift for mother, girlfriend, daughter, friend, sister, colleague or any special person you can think of. The photo was taken under the sun, and the Galaxy ball is most beautiful when viewed under the light. You get WHAT you're paying for.Different from the cheap universe glass on the market. the Pavaruni galaxy necklace is designed by Pavaruni Original studio, which is priced $100~250 in Japanese stores. Each glass is handmade by craft mans who has more than 30 years experience. 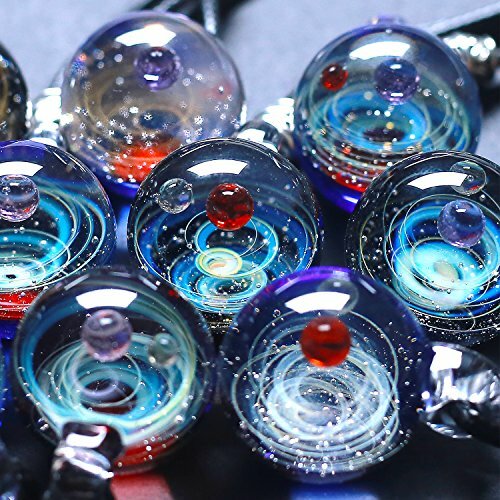 It is a great gift in Japan, while you get the galaxy necklace, you will find out it is more beautiful than the picture at any angle. Making such a beautiful glaze needs rich skill and experience, since each glaze is handmade for 3 hrs at 3600 degrees with low succeed rate. Each necklace has a 2cm galaxy pendant and 75 cm exquisite leather cord, easy to wear(The tangle-free magnet string is very likely to fall) . If you put the cord away,it will be a elegant tabletop decoration. Come in an exquisite gift box, ideal gift for special day. It will be a great surprise for the one you love. Honey,I will give you the whole universe. It will be the best christmas gift of the year. It will be the best birthday present in your life. This will be the most exquisite gift you have ever received. Pavaruni universal glass will be the best collection in your life time. Treasure the First Galaxy necklace in your life! Pavaruni Original Studio.You won't find the same Galaxy glass ball on the market! Best Quality but most reasonable price.Every universal glass pendant is unique, handmade by the experienced craftsman.